A subtle and sweet innocence bouquet. 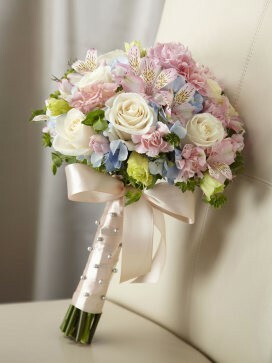 This subtle and sweet innocence bouquet is full of endearing charm. The sumptuous and sweet scented selection of stunning cream roses alongside a medley of adorable fresh flowers makes this bridal bouquet one of classic cuteness! 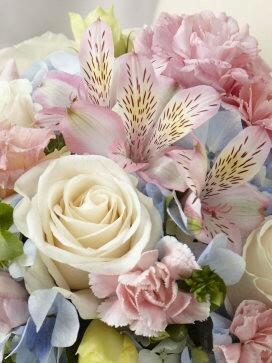 Featuring; cream roses, pink mini carnations, pink alstroemeria, pink double lisianthus, blue hydrangea and bupleurum. 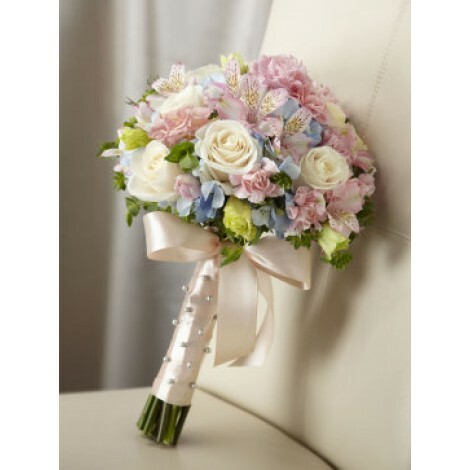 This hand-picked, sweet scented selection is hand-tied with a soft peach satin ribbon, completed with pixie pearl pins creatively placed into the ribbon which culminates into a beautiful hand-tied bow. Approximate Dimensions: 16"H x 12"W.